One of the upsides of being a deputy stage manager in a producing theatre is that the work can vary so much on a daily basis. Ahead of panto season, you can be making comically large chainsaws during the day then calling an Alan Ayckbourn play in the evening. The variety of the challenge is what keeps many of us going. It is also the freedom to have some creativity on a practical level, rather than simply adjusting the layout of our rehearsal calls every now and again. Of course, working in a mid-scale regional theatre, there are limits to what we can produce, in terms of budget, time and the equipment available, so adaptability is key. 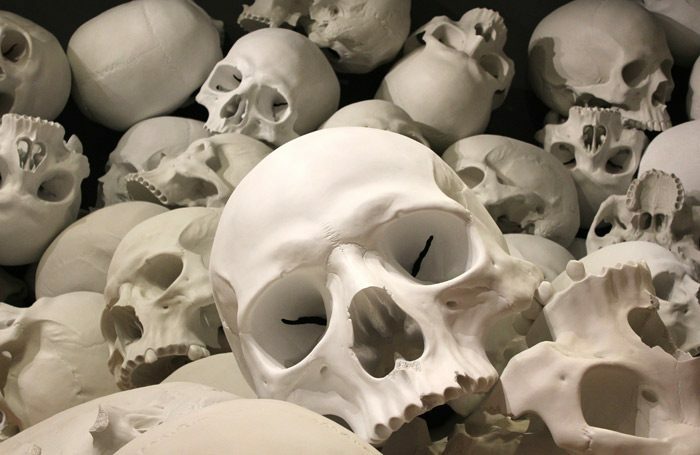 For the past few months, we have been hand-making 80 skulls, and 150 other bones to be smashed on stage each night in an upcoming production of Martin McDonagh’s play A Skull in Connemara. Initially this seemed like quite a large task; but since we had more than three months to complete it – albeit in between producing and performing panto and another show – we worked out that if we could create only two skulls and four bones a day then we should be finished well within the time. We started by contacting Nathan Rose, the head of props at Nottingham Playhouse, to see how he created the bones for its production of the same show. Nathan was kind enough to share details of the materials he used, how he created his moulds, and the budget needed to produce them. Unfortunately, while the method was perfect, our budget didn’t match his and we had to go back to the drawing board. With a bit of initiative and some scouring on eBay, we bought two rubber skull moulds and made some bone moulds with latex and an educational skeleton. After a trip to the local art shop for a bag of dental plaster, the experimentation began. We needed to create skulls that would be sturdy enough to be shoved into bags with assorted other bones, but could be smashed to pieces with a wooden mallet. The delicate features on the front of the skull had to be made thicker to withstand being handled without looking too solid, and the back of the skull worked to the perfect thickness to break under blows. There is always a magic formula to prop-making of this kind, and after only two slightly crumbly attempts we hit upon it. Then came a lot of online research into the appearance of exhumed skulls and bones. The paint, mud, and glaze effect was applied to the first three skulls, which we dubbed “Oona”, “Two-na” and “Trina”. These were approved by the designer Katie Scott and director Chris Lawson. Everything now became more of a well-timed production line. With panto season over, our workshop is beginning to resemble a catacomb as we return to full-scale bone production – between production meetings and rehearsals of course. But then multitasking is stage managers’ bread and butter after all.